(Chris Detrick | The Salt Lake Tribune) Brigham Young Cougars quarterback Tanner Mangum (12) throws the ball during the game LaVell Edwards Stadium Friday, October 6, 2017. If BYU’s quarterback battle really is as close as indicated by coaches, there’s only one thing for them to do, for many reasons: Start Tanner Mangum. If it’s not that close, there is the alternative. Not sure that Kalani Sitake, Jeff Grimes and Aaron Roderick will follow the logic here. Just saying they should follow it, even as whispers leak out one day that Zach Wilson is edging ahead, and the next that coaches are giving Mangum every opportunity to close the deal. There’s a mighty chance that BYU, no matter how effectively the Cougars bounce back from the competitive disaster that last season caromed into, will face an arduous climb in the early part of this season, commencing as they do against Arizona, Cal and Wisconsin in the first three weeks, and then Washington two weeks later. 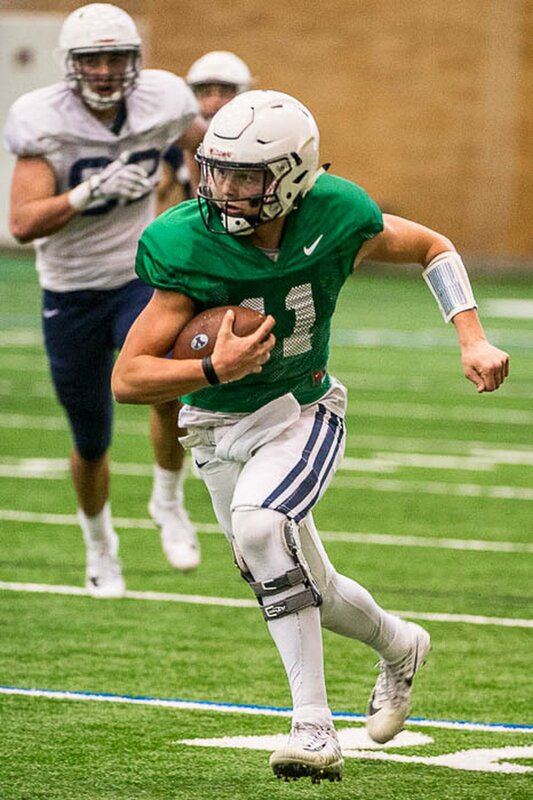 Unless the freshman Wilson clearly has blown past the senior Mangum, there’s no reason for BYU to chuck the kid out into the path of that oncoming road grader. Mangum, at least, has faced those kinds of challenges before. Three seasons back, he beat a number of good teams in pressure situations, including Nebraska on its home field and Boise State at LaVell’s Place, and kept the Cougars close in other big games. Last year, absorbing too much of the blame himself when that blame should have been hauled by an entire offense, an offense that was beyond pathetic, Mangum struggled in a way nobody expected. And then, he blew out his Achilles tendon. Staring down those troubles, as well as responsibly working through periods of depression, Mangum ascended over and bored through a dark competitive span that would have roughed up any collegiate athlete, earning him the respect of his teammates by fighting back. He rehabbed hard. He lost 20-plus pounds. He got stronger. He threw himself into a crowded race for his old starting spot. He chased away the shadowy notions that he wasn’t a leader, wasn’t one of the guys. He studied Grimes’ new offense. And he matured as a person. So he did. He narrowed a crowded QB race down to two, alongside Wilson, a young prodigy with time on his side and the ease of manner that comes with it. If the final stages of that race remain neck and neck, Mangum deserves another shot. He was ill-suited to run former offensive coordinator Ty Detmer’s offense, just as every other player on that offense seemed to be. He piled up all kinds of promising yardage, though, even as he was unprepared to do so, coming directly off an LDS mission, running Robert Anae’s attack. Taysom Hill’s injury forced him onto the field, and he responded. (Trent Nelson | The Salt Lake Tribune) BYU football practice in Provo, Friday March 23, 2018. Quarterback Zach Wilson. If Mangum gets the chance to start again, his football story will be completely on the line, wholly vulnerable to risk, wholly positioned for reward. Against that kind of competition, there are no guarantees of victory. But that last part is also true for a 19-year-old freshman who never before has played college football, let alone college football against outfits like Wisconsin and Washington, who could each be among the best fistful of teams in the country. Better to start the veteran, then. See if his experience of the past, including overcoming an inability to even walk on that busted Achilles, has steeled him to the point where he can face down this challenge, too. If he can’t, and BYU loses, and the season starts to lurch, that’s when you bring in the freshman, especially as the schedule lightens a bit. That’s a good move for the psyche of the program, for the psyche of the fans, for the longevity of the coaches, who feel the pressure that’s real. 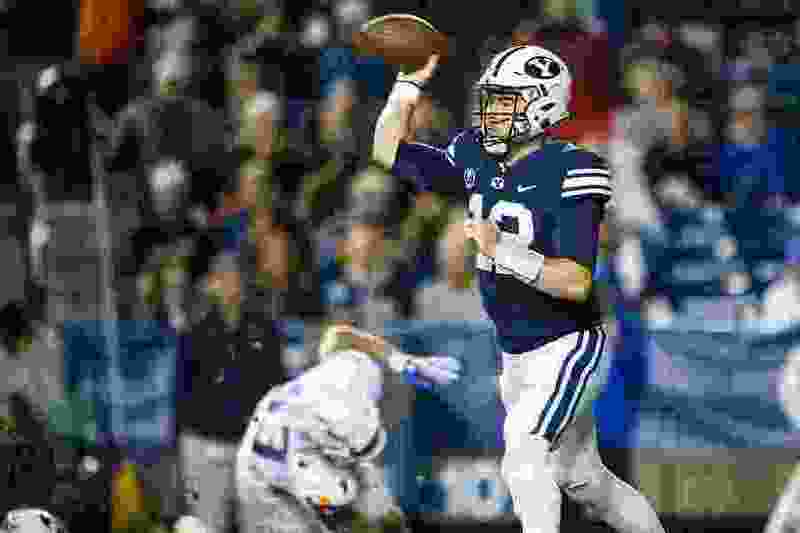 If defeat comes early, and the kid is spared, standing on the sideline, watching and learning, remaining unscathed, and then beatable teams arrive, enabling the new quarterback to gain confidence and, at some level, shine, now Sitake and his staff have new hope in the numbers. Even if the Cougars end up with five or six wins, the coach can dial up Tom Holmoe, point to the new guy behind center and lay claim to the dawn of a new day. Starting Mangum, either way, no matter how the record runs, is the smartest move. If the senior shows well, and the Cougars win a couple of early games, all good. If he struggles, and Wilson is brought in, then there’s that aforementioned promise. It’s certainly easier to go with the experienced quarterback, and then, if needed, bring in the inexperienced one in relief than it is to demote and embarrass the veteran, start Wilson, watch the rook’s confidence fritter away in defeat, and then turn back to the vet, lying to him, telling him you never doubted his abilities from the jump. Falling onto that path could lead to another disastrous season, with the entire team losing faith not just in themselves, but in the decision-makers leading the program. Unless, of course, Wilson is far ahead. If he is, and the team knows it, then … never mind.